This month we leave the code breaking behind and focus on what became an important part of the Off-Duty time for many of the staff at GC&CS during World War 2. With a staff drawn from so many clever and gifted people it wasn’t long before there was a film society, a gramophone club and various clubs for amongst other things fencing, sculpture, architecture and Scottish Dancing. 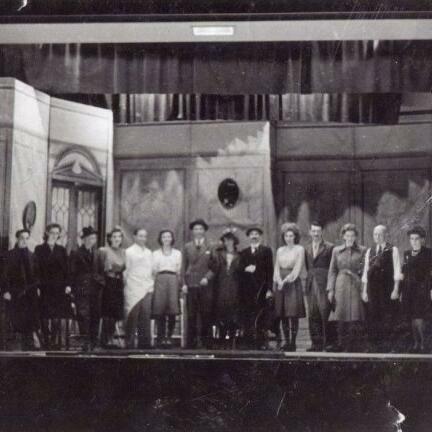 One of the most successful of these was the Bletchley Park Drama Group who between 1941-1946, staged performances of established plays and wrote their own musical reviews. Bletchley Park volunteer steward and guide, Harold Liberty, has been researching the Drama Group over the last year and we sat down with him to find out what he had discovered. Our Veterans add some colour to the story as they fondly remember the Drama Group from interviews from our own Oral History Archive.